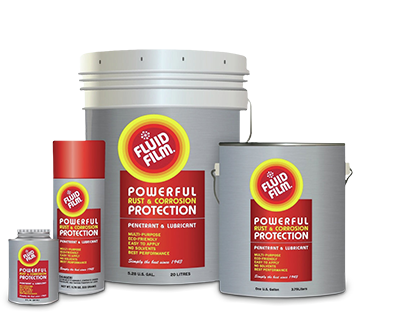 Fluid Film Gel BEW is a permanently soft, anti-corrosive gel coating for large metal surfaces such as tanks, structures, etc., where a permanent soft coating is not objectionable. It is specifically formulated to resist the degrading action of sunlight, and is not for use on surfaces which will have a temperature in service of over 158° F (70°C). New Construction: No sandblasting required. Remove any loose mill	scale. Clean up all debris. If surface has been shipped primed with inorganic zinc, do not coat until the zinc has been cured a minimum of 30 days. In Service Equipment: No sandblasting required. Remove flaking rust and peeling paint. Break all blisters larger than 25mm (one inch). Remove all standing water. Clean up all debris and silt. May be applied over tightly adhering rust.Residual bitumastic and asphalt coatings must be removed to leave a thickness of no more than 50 microns (0.002 inches). If surface is heavily scaled, consult your Eureka representative. For further details, see Technical Bulletin #202.4. Alemite 7896 pump (22/1 ratio) or equal, and a flow gun. See Technical Bulletin #202.1. Under extreme cold conditions, storage of material in a warm room will facilitate application. 250²m (2750 ft²) at 0.80 mm (0.030 inches) thickness for mild exposure to 163m² (1760 ft²) at 1.18mm (0.050 inches) thickness for very severe exposure. Scrape off excess then wash with hot water and mild detergent or any commercial degreaser. None. Equipment may be used immediately after coating. 96C (205F). This value is given for information purposes only and is not to be constructed as a recommendation for maximum temperature use. All components of FLUID FILM® GEL BEW are listed on the TSCA Inventory.